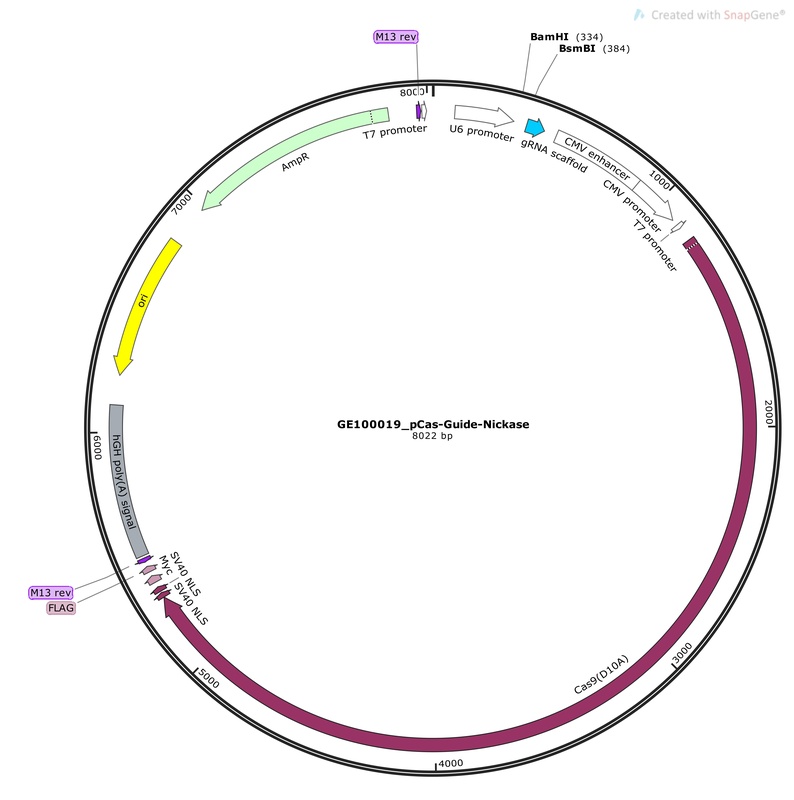 The latest tool in genome editing – CRISPR/Cas9 – allows for specific genome disruption and replacement in a flexible and simple system resulting in high specificity and low cell toxicity. The CRISPR Cas9 genome editing system requires the co-expression of a Cas9 protein with a guide RNA vector expressed from the human U6 polymerase III promoter. 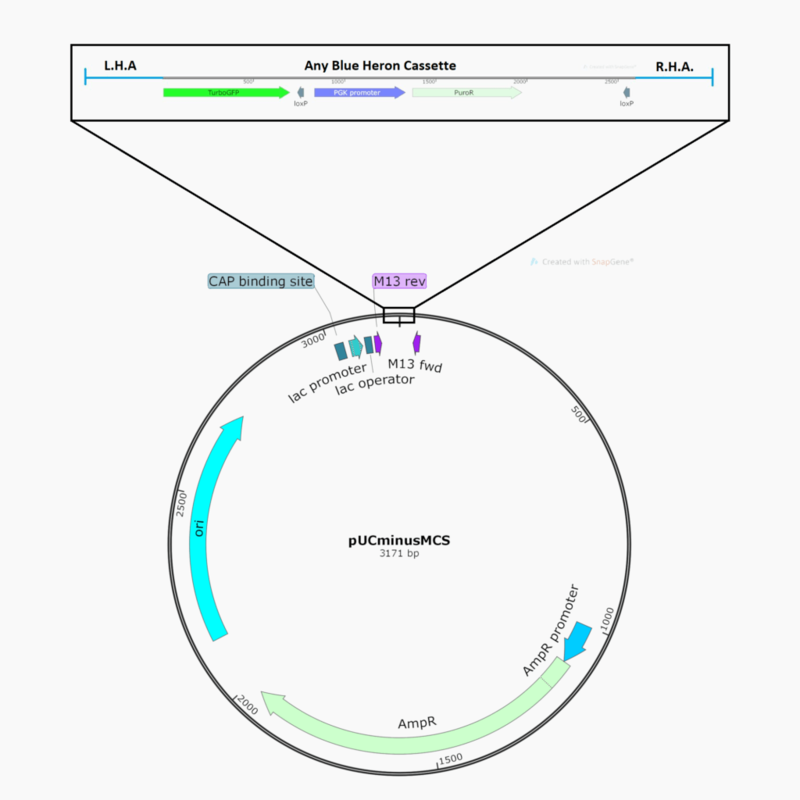 With the protospacer-adjacent motif (PAM – the sequence NGG) present at the 3′ end, Cas9 will unwind the DNA duplex and cleave both strands upon recognition of a target sequence by the guide RNA. 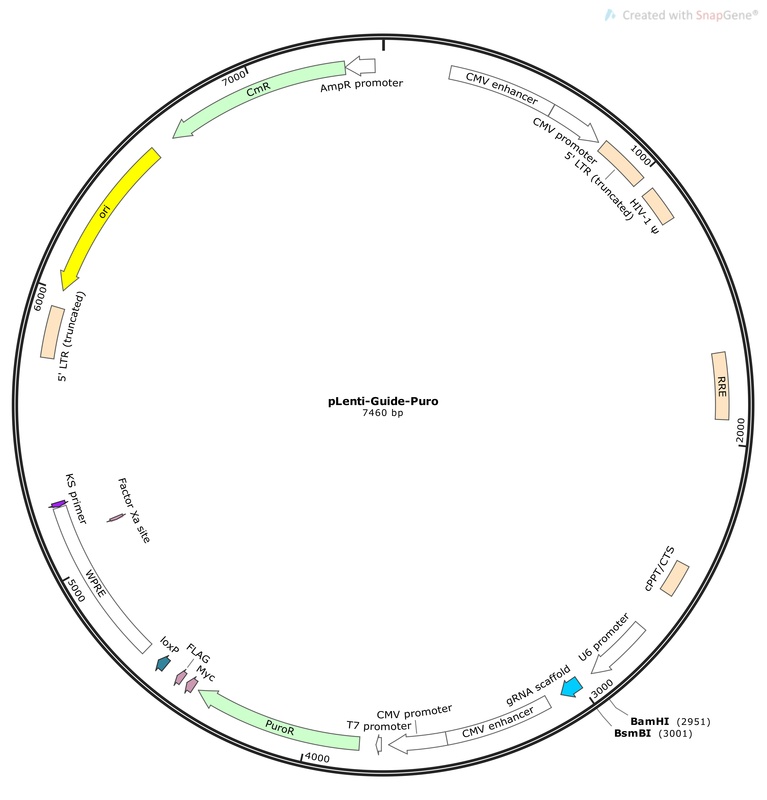 The functional cassette synthesized by Blue Heron Biotech, in the rescue donor vector, can then be inserted into the unwound DNA. 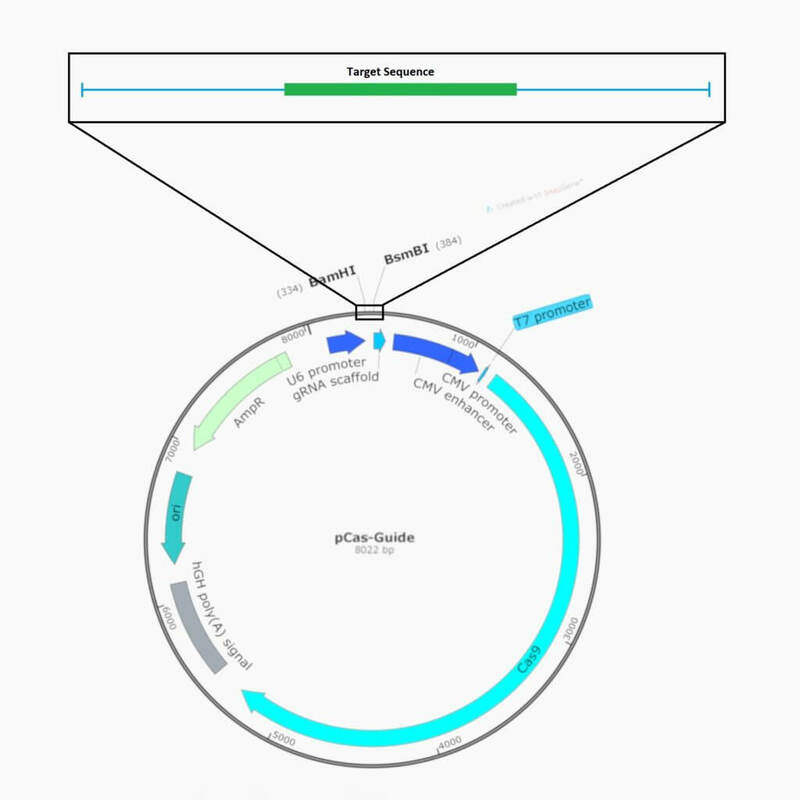 The repaired genome will now express your desired sequence with or without tags. 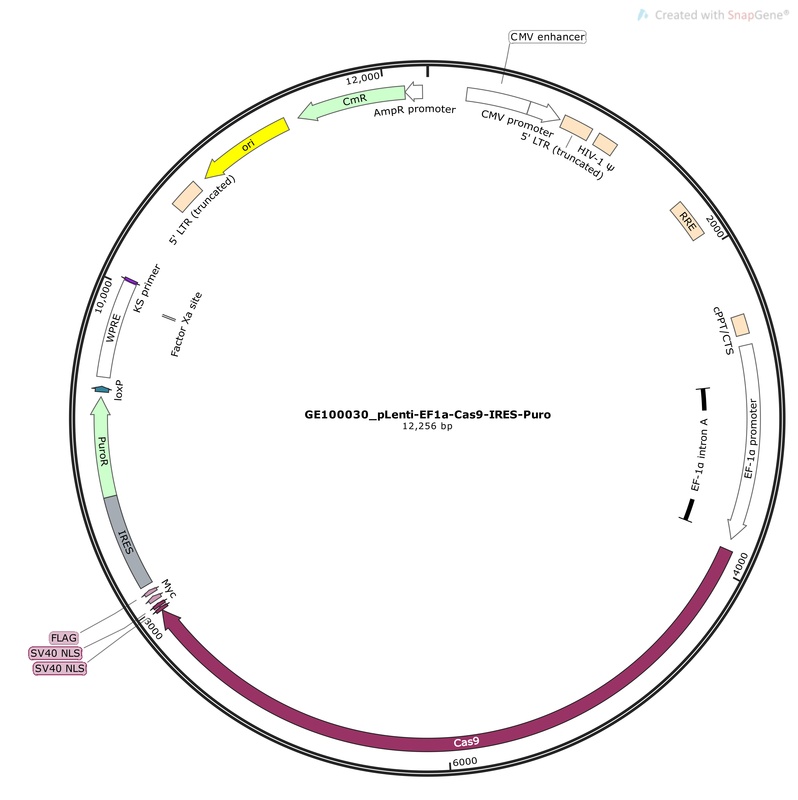 Blue Heron Biotech will clone your target sequence into any CRISPR/Cas9 guide vector. Alternatively, Blue Heron will construct a donor vector using any of our predesigned functional cassettes. Customers also have the option of providing their own vector of choice. Once you receive your order, cotransfection with Turbofectin 8.0 or your choice of transfection reagent will yield the desired edited chromosome. 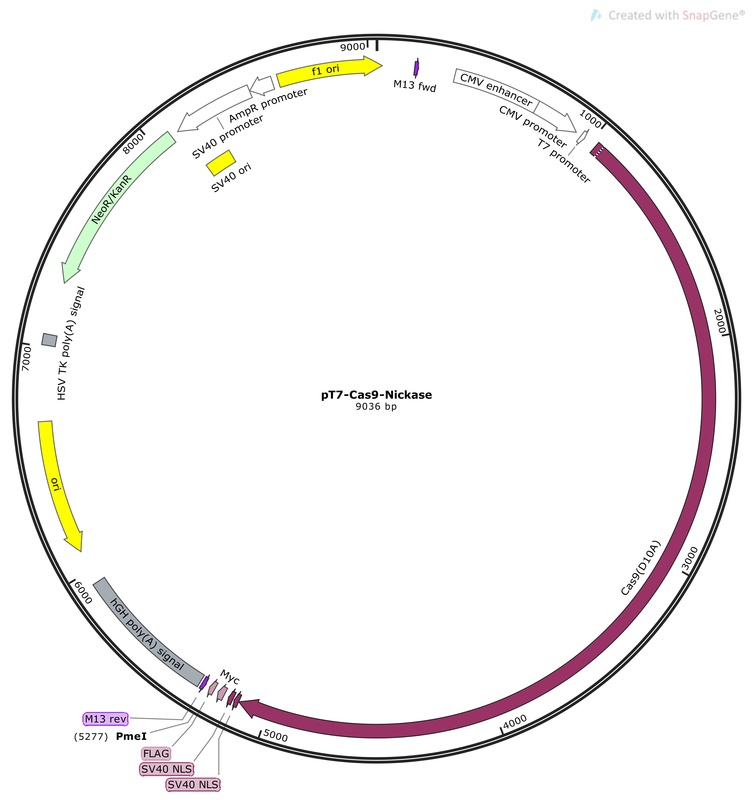 Blue Heron genome editing cassette A ptGFPPuro insert with green fluorescent protein a PGK promoter puromycin resistance and lox sites. 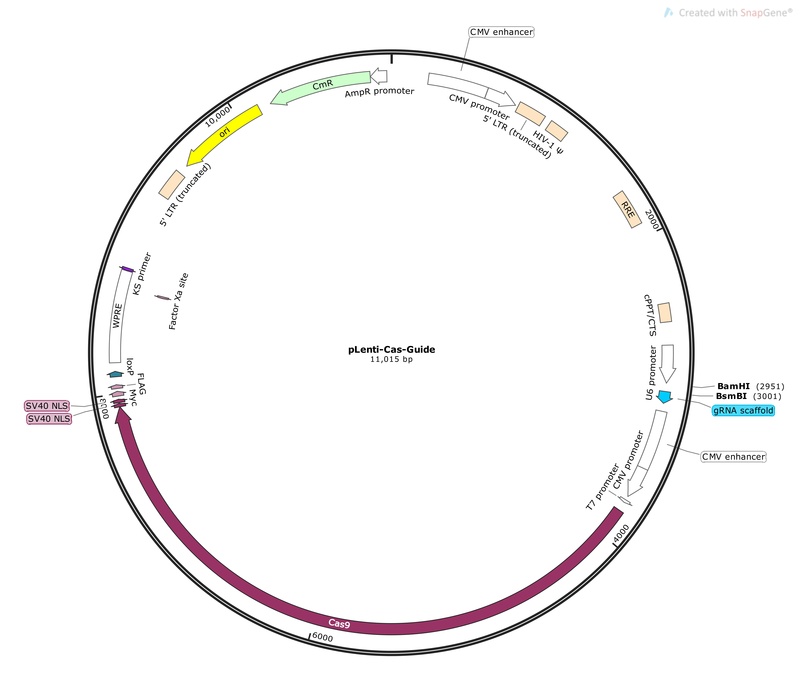 Blue Heron’s genome editing cassette B with red fluorescent protein, a PGK promoter, blasticidin resistance and lox sites. 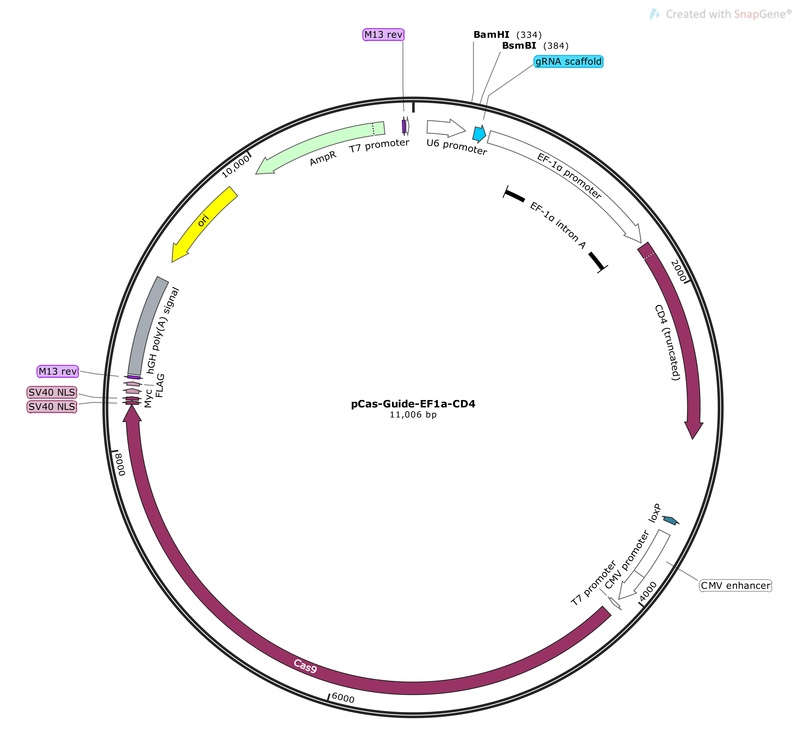 Blue Heron’s genome editing cassette B insert with luciferase, a PGK promoter puromycin resistance and lox sites. Blue Heron’s genome editing cassette D insert with green fluorescent protein, a PGK promoter, reverse puromycin resistance and lox sites. 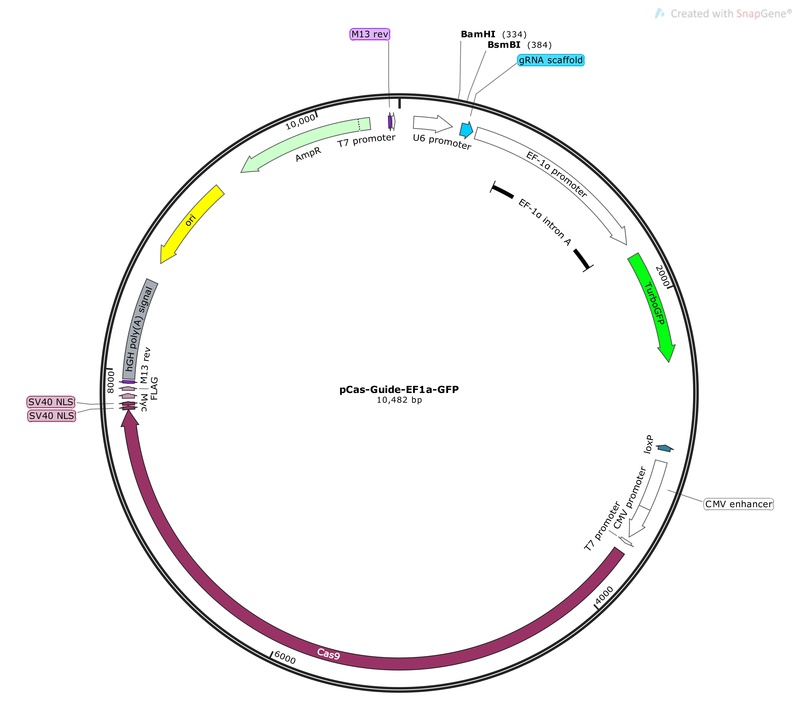 Blue Heron’s genome editing cassette E insert with blue fluorescent protein, a PGK promoter, neomycin resistance and lox sites. 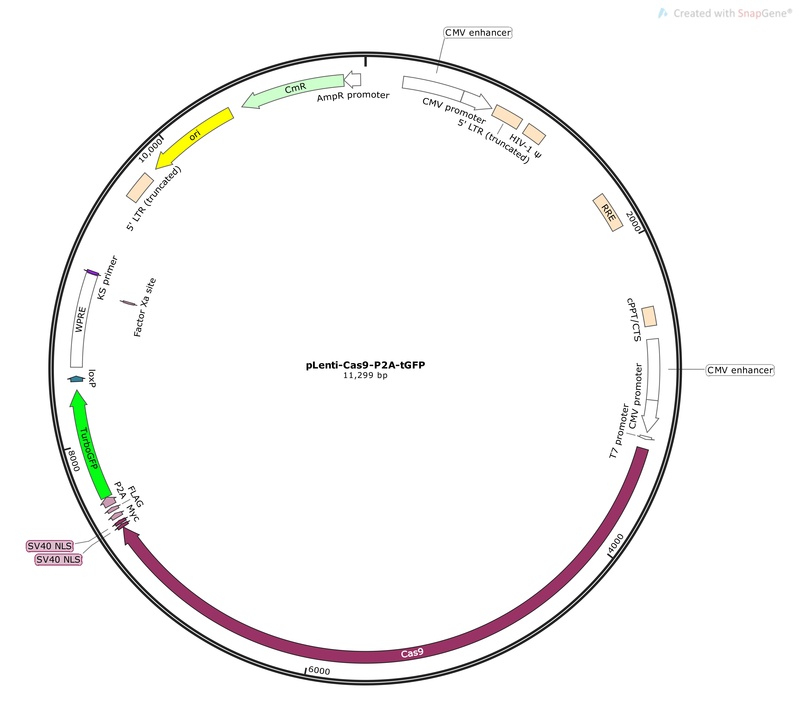 Blue Heron’s genome editing cassette F insert with green fluorescent protein, a PGK promoter, neomycin phosphotransferase and lox sites. 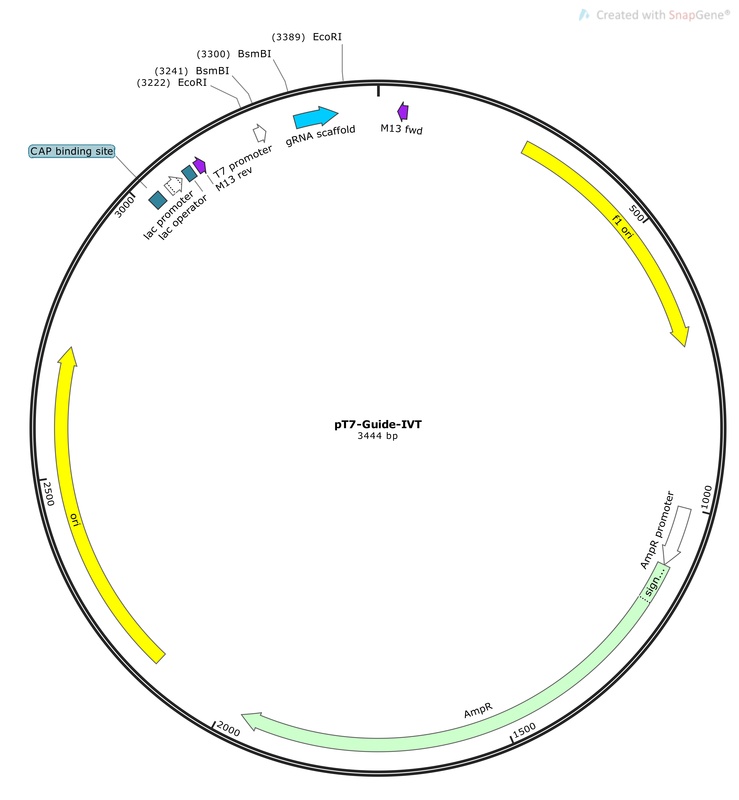 Blue Heron’s genome editing cassette G insert with a PGK promoter, puromycin resistance and lox sites. 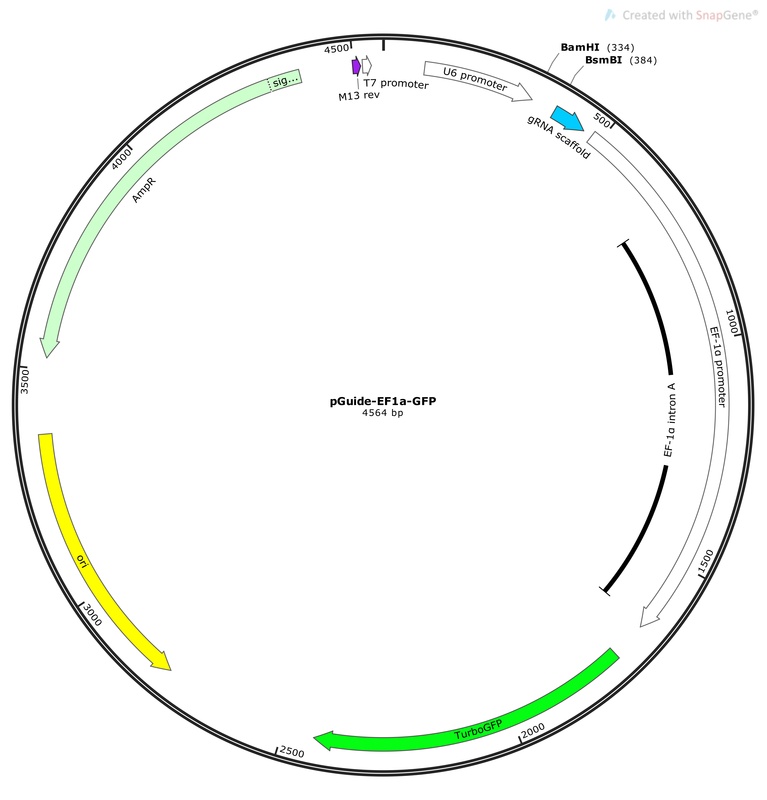 Blue Heron’s genome editing cassette H with red fluorescent protein, a PGK promoter, puromycin resistance, and lox sites.